The class 86 was planned according to the DRG standard type program to haul heavy freight trains on lines with gentle grades as well as passenger trains and mixed trains on lines with steeper grades. By 1943, 774 units had been built by almost all of the German locomotive builders. The German Federal Railroad used these nimble and powerful tank locomotives to pull all kinds of trains as a "Jack-of-all-Trades" mainly on main lines and branch lines in the Mittelgebirge Region. The class 86 locomotives could also be spotted pulling ore cars, chiefly in Saarland with its steel mills in Neunkirchen, Brebach, Burbach, Dillingen, and Völklingen. Prototype: German Federal Railroad (DB) class 86 steam locomotive. The locomotive looks as it did in Era IIIa. 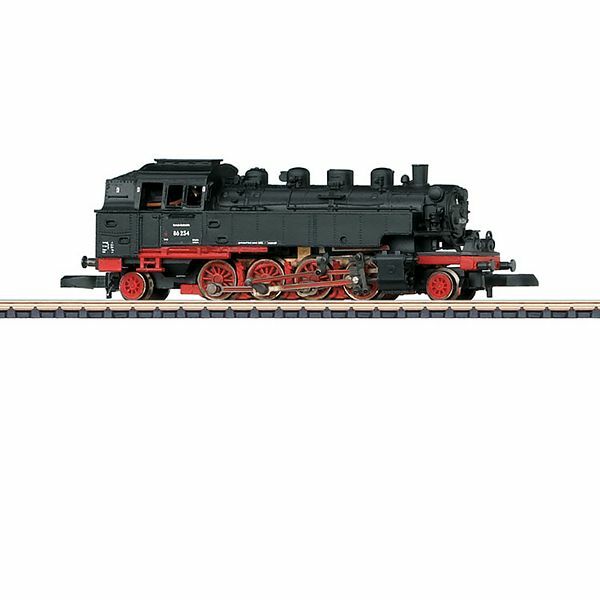 Model: This model of the class 86 steam locomotive has been reworked compared to earlier versions and now has a motor with a bell-shaped armature. In addition, it has LED headlights, detailed, full working valve gear, imitations of brakes, and other details. Length over the buffers 63 mm / 2-1/2". One-time series for the Märklin Dealer Initiative (MHI). This locomotive is the perfect add-on for the 86307 car set.